Jenna and Sean had the most romantic New Year’s Eve wedding at the Ashford Estate this year and I couldn’t think of a better place to start 2019 than with these two! Jenna and Sean met in Hoboken about 6 years ago through Sean’s cousins (one of Jenna’s bridesmaids!). When the two met up, Jenna immediately knew something was different about Sean and realized they clicked pretty quickly. Before long, they wound up in a long distance relationship while Jenna finished PA school in Connecticut but they moved back to New Jersey not long after she was done. Time flew by and before they knew it, Jenna and Sean were planning their New Year’s Eve wedding! NYE seemed like a great time to get married - it would bring everyone they love under one roof for two celebrations and they wanted their day to be filled with dancing, good food and drinks. I can’t think of a better way to ring in the New Year than that! Their wedding at the Ashford Estate was inspired by weddings they attended of family and friends, plus some sweet personal touches throughout the day. I loved that they included some reminders that it was New Year’s Eve in their decor too… their clock menus were so cute and I was obsessed with the glitter dyed champagne bottles on the tabeles! Jenna told me that she always envisioned their wedding day having a romantic, rustic vibe and that was part of why she settled on greenery and candles for their reception accents, instead of tons of flowers! I think all of the green, gold and burgundy accents came together perfectly!! My favorite part of their wedding day was their romantic ceremony in an all white barn filled with lanterns, candles and tons of greenery. I was speechless when I walked in. Also another star moment was Jenna & Sean wanted to practice their dance during cocktail hour and take some photos in the ballroom. I was blown away when Sean scooped her off the dance floor and swung her around in her gorgeous wedding dress (mind you weighs 35 lbs!). I guess taking professional dance lessons is the new trend and I’m loving it! 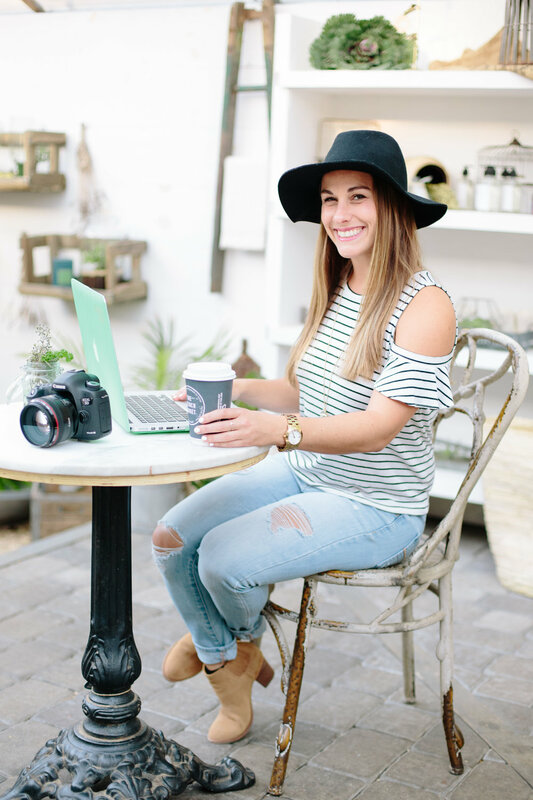 When I asked Jenna what advice she had for brides to be, she said “…to plan in advance as much as possible, space out your purchases and remember the day is for you and your spouse, not anyone else” and I couldn’t agree more! Jenna and Sean, your vision came together beautifully. Enjoy your time away on your honeymoon and congratulations again! Inspired by this NYE wedding? Pin this image or any from the post above! Andrew and Kat’s classic Bear Brook Valley wedding day was truly something special to be a part of! These two created an incredible day to celebrate their love! Andrew and Kat met on St. Patrick’s Day in 2013 at a local pub, where they danced and kept finding their way back to each other as the day wore on. Before they left, Andrew made sure to put his number in Kat’s phone (and friend her on Facebook!). After a few weeks, the two met back up and had their first official date! Kat told me that it’s always been how comfortable they are together - and how easy things are - that has truly made their relationship special. 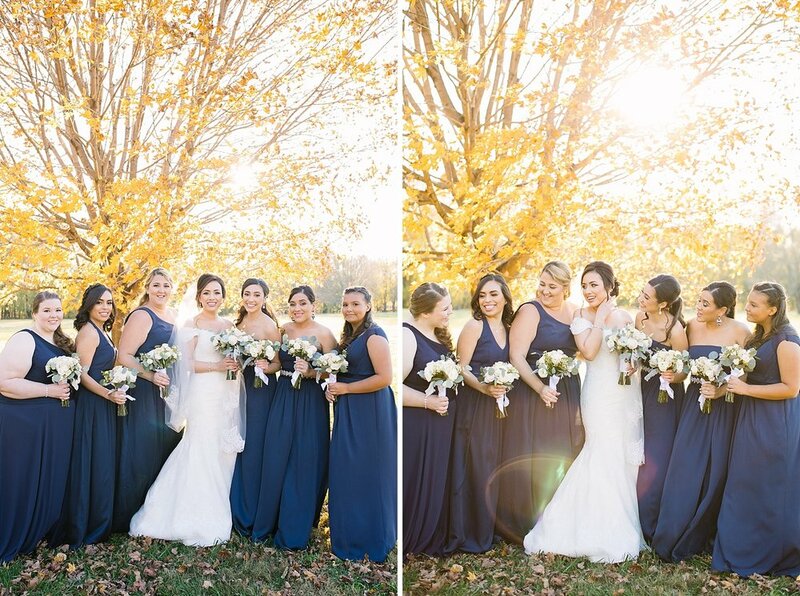 The two chose to have their fall wedding at Bear Brook Valley because they loved the venue. Throughout the day, they had carefully chosen details that they incorporated into their day to celebrate their incredible families, including Kat’s grandfather’s stole and a bagpiper for her grandmother. Seeing all of those special details was incredible - you can tell how much they love each other and their families! Kat and Andrew’s day was classic and elegant, with a few beautiful rustic touches. The entire day was stunning but my favorite part was definitely some of the incredible handmade items by my good friend Christina of Blue Mae Events! She absolutely rocked this wedding - I can’t believe she HAND MADE the floral wall used for the name and table cards for guests! My other favorite part of this wedding day was the snowfall we got. Although we were all surprised by it, it was insanely romantic! It was absolutely beautiful and the little Episcopal church they were married in was so incredible as the sunset with a fresh coat of the first snow fall of the season! Inspired by this winter wedding? Pin this image or any from the post above! Desiree and Brian’s gorgeous Crystal Ballroom wedding in Thompson Park was the perfect way to spend a day. Their wedding was full of romance, sentimental touches, and tons of love. Desiree and Brain met in high school - and despite Desiree not being a fan of Brian at first, his persistence paid off! In 2011, the two began dating on Halloween (Brian even asked Desiree if she wanted to start dating a different day so it was “normal”, but she said it gave everything character!!). Although they weren’t technically dating at the time, they spent all of their free time together walking to the waterfall and spending time together. College quickly came and went, while they two grew in their relationship with each other. 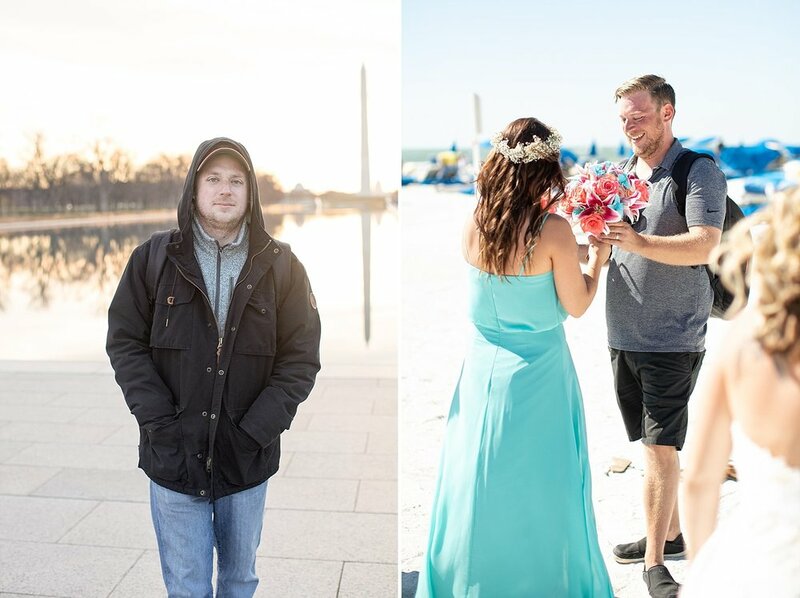 Brian told me that he knew he was going to marry Desiree long before she knew she’d marry him, but either way, they’re so happy with how everything turned out. Choosing a November wedding date was an easy choice, as they both love fall and it wasn’t too far from their dating anniversary. Finding their venue in the Crystal Ballroom was just as easy - they said as soon as they walked in, they knew it was the venue for their dream day! Desiree and Brian worked hard to create a wedding day that was romantic and full of personal touches. One of the special things the two incorporated into their day was using the same wording on Desiree’s parents’ wedding invitation on their own! How sweet is that? Her bouquet also had charms to remember their family members who are not longer here and able to enjoy their wedding day. Seriously the amount of love put into the details showed! Desiree told me she encourages other brides to slow down and enjoy every moment of wedding planning! It goes by fast (and I concur!!). My favorite part of their beautiful day was their amazing choreographed first dance as husband and wife- it was so romantic!! It was definitely something very special to be a part of! Their dance instructor was even a guest at their wedding. What an incredible memory for these two. Desiree and Brian, congratulations!! I hope you enjoyed your wedding day and honeymoon!! Thank you for letting me be a part of such a special time in your lives! Inspired by this Thompson Park, New Jersey wedding day? Pin this image or any from the post above! I’m so excited to be sharing Emily and Jeff’s gorgeous November wedding at the Estate at Florentine Gardens in River Vale, New Jersey! Emily and Jeff met in August of 2011. Somehow, while Emily and Jeff shared mutual friends and classes throughout their time at Cornell, they hadn’t crossed paths until then. Both were "on line" at the guidance counselor's office to change classes when Jeff approached Emily and asked her to go out on a lunch date. Time wore on and the two became friends - talking every day, sharing music videos and talking about life. Graduation came and Emily began working in NYC and after Jeff’s graduation, he moved to Florida. Despite all of this, the two stayed in touch. In November of 2013, Emily surprised Jeff by appearing at one his band's shows. Both knew when they reconnected that something was meant to be and this was no coincidence. Five years of memories, laughs, and adventures later, here they are getting married! Their entire wedding was absolutely incredible from start to finish and a true representation of the two of them. 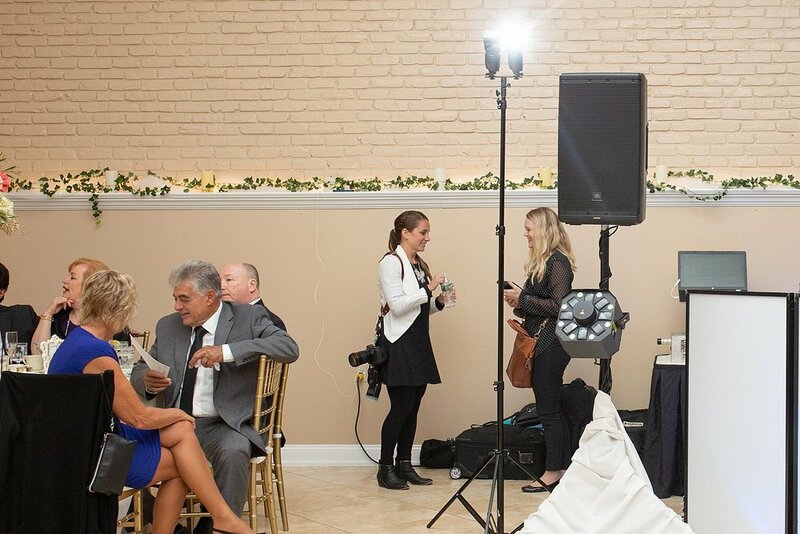 Emily and Jeff booked their wedding date around their favorite band, Brian Kirk and the Jirks, so that they could keep their dance party going all day long! I love that! They even planned an after party at a local brewery for after the ceremony and reception finished. One of the coolest things about their day was that they are both big foodies (Jeff cooked Emily an elaborate meal for their first date!) so their favors were a make your own spice jar bar and infused olive oil made by the two of them. How unique is that?! The rest of their wedding decor had a very organic feeling to it - springs of rosemary at each place setting and fresh florals for the centerpieces. It all came together perfectly. My favorite part of their wedding day was definitely the bad! They were so good and everyone was dancing the entire time! Emily even jumped up on the stage in her super cute jumpsuit to jam onstage - and Jeff was singing with them throughout the reception! It was a blast!! 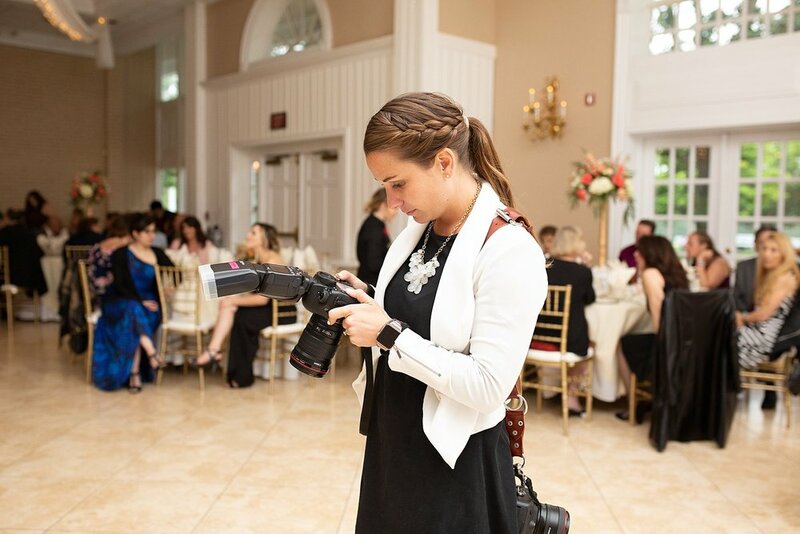 Inspired by this New Jersey wedding? Pin this image or any from the post above! A beach wedding was the perfect way to kick off November! Caitlin and Tyler’s beautiful modern beach wedding at Windows on the Water in Sea Bright was an incredible day to be a part of. It was clear from start to finish that not only were the two of them so excited to get married (after knowing each other for 11 years!) but also that everyone who was there was so thrilled to be a part of their love story’s greatest chapter yet! Tyler and Caitlin met 11 years ago in August when they were both servers at Hemingways Cafe in Seaside Heights. They started working together when the restaurant opened. Caitlin told me that it was definitely one of the best parts of their lives - being young, having fun, late nights and stress-free jobs! Before they knew it, the two of them realized that they didn’t want to be without each other and moved in together. They bought a house and brought their sweet cat, Mr. Rescue (he made an appearance on their wedding day!) home... and then, “finally!” put a ring on it! Finding inspiration in their love story and their deep love of the beach, the two planned a fun, modern wedding oceanside at Windows on the Water. Caitlin and Tyler told me when they walked into Windows on the Water, they realized right away it would be the venue for them! Their day was filled to the brim with special, personalized moments - even down to their sweet cat and his sign! Although their entire day was a blast, my favorite part of the day was their bridal party intros. Everyone’s were so creative and the entire reception room was cheering and dancing along! There was so much excitement and energy in the room, I knew there was going to be a lot of dancing thoughout the night and I was right! Oh… and DJ had sparklers go off for the bride and groom’s entrance! Can we talk about amazing?! Caitlin and Tyler, enjoy your St. Lucia honeymoon and soak some sun rays up for me! Here’s a sneak peek at their incredible wedding day at Windows on the Water! Love this Windows on the Water beach wedding? Pin this image or any from the post above! Monica and Dan’s wedding at Stone House at Stirling Ridge was absolutely stunning!! Despite the gloomy day, their love was radiating and lighting up everyone around them. Their love story started in the summer of 2011 when they worked as co-counselors at a summer camp! They parted ways that summer as just friends but kept in touch until Monica returned home for the summer where they reconnected and…. well, now they’ve gotten married! 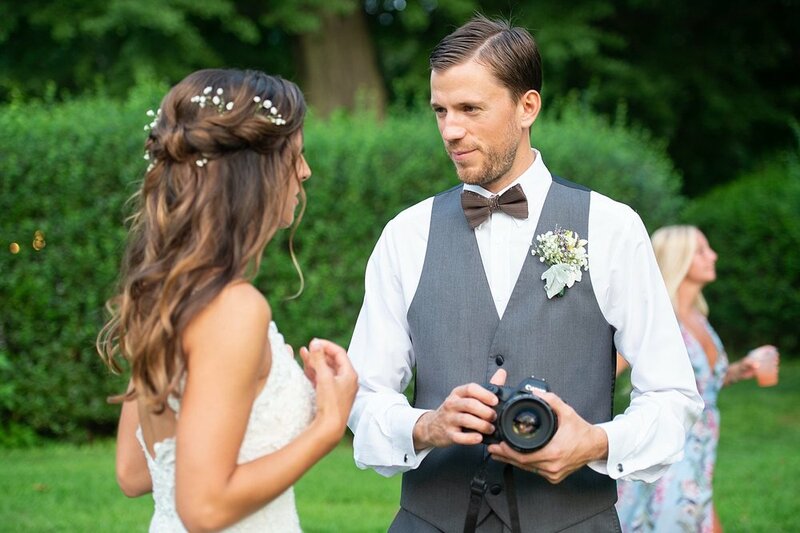 Dan and Monica got engaged while they were vacationing in Oregon so Monica wanted to use that trip as inspiration for their incredible wedding day. The Stone House at Stirling Ridge proved to be the perfect canvas for their rustic elegant inspired wedding day. Monica worked hard to design elements of their day that would invoke images of the rustic Oregon coast. She included lots of vine-wrapped light fixtures and canedelabras and their naked cake was a perfect rustic touch! Even Monica’s wedding dress had an elegant floral illusion that Pronovias is known for and Dan’s dark attire brought their day together. When I asked Monica what her advice was for other brides, she told me “The biggest piece of advice for brides to be is do what YOU want to do! Not what you think everyone else wants or prefers. It is the one day that you can say is yours so don't let anything or anyone else dictate that.” And, boy, is she right!!! Seriously their day was beautiful from start to finish, but my favorite part of the day had to be working with Monica’s sweet bridesmaids. Even though this fall wedding was gloomy and rainy, everyone was so energetic and strived to make Monica and Dan’s day fun! How lucky are they! Everyone made this wedding such a blast and I’m so happy I got to be a part of it!